The end of the school year may have already come for some of you, but for us– tomorrow is the day. Most of my kids are excited for Summer and the loosening of rules and bed time and all the activities they can cram into the vast infinity of their free time. Then you have the youngest son who’s a mix of excitement over what advancing to second grade will hold, and a bit of trepidation at leaving the 1st grade behind. But we’re taking it all in stride with each kid and each grade level, enjoying all their awards ceremonies and personal accomplishments each year. In elementary school though there’s one particular end of the year celebration we all always look forward to: the end of the year picnic. The kids over piling up on a blanket or towel with all their best friends from their class that school year. We parents gather on the fringe and mostly just embrace the ants and the dirt that we’re left with. It’s totally worth all those grubby little smiles and blooming friendships. Most parents seem to have the same thoughts as I do, and pull out and load up the family picnic basket with yummy favorites. A great mixture of pasta salads, potato salads, potato chips, and lunch meat sandwiches and fried chicken. It’s heavenly. And I sooooo long to participate– to have that excuse to showcase my latest creation that is just begging to be brought to a picnic lunch. But then there’s my kids to take into consideration. And they’re used to my cooking every day of their lives and it’s a special occasion– and they want things like lunchables. And no homemade ones won’t do, I tried that more than once. Of course, I give in to their brown bagged requests, as long as they’re on sale– that’s my only rule. That, and if you’re hungry later don’t cry to me because I could have told you so. Anyhoo, all those wonderful ideas that came to me at the mere thought of planning a picnic don’t simply disappear. They stay, they dig down and take root. And that’s ok because we have picnic suppers. I will spread out a big blanket in the living room, usually my Dad’s old army blanket from Vietnam, and we go to town on some hot dogs and picnic style sides. This is exactly how I was able to get this pasta salad out of my head even after my foiled gourmet picnic planning. 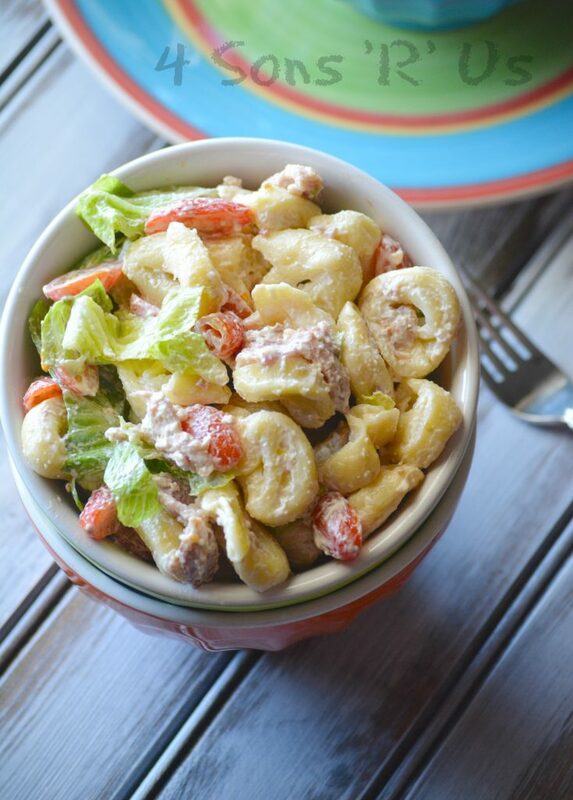 Who knew you could feature tortellini in a dish that’s best served cold? Although with cheese and pasta both prominently featured in so many Summer salads I suppose it’s not too far of a leap. This dish is perfect for potlucks, parties, and even the old family picnic. 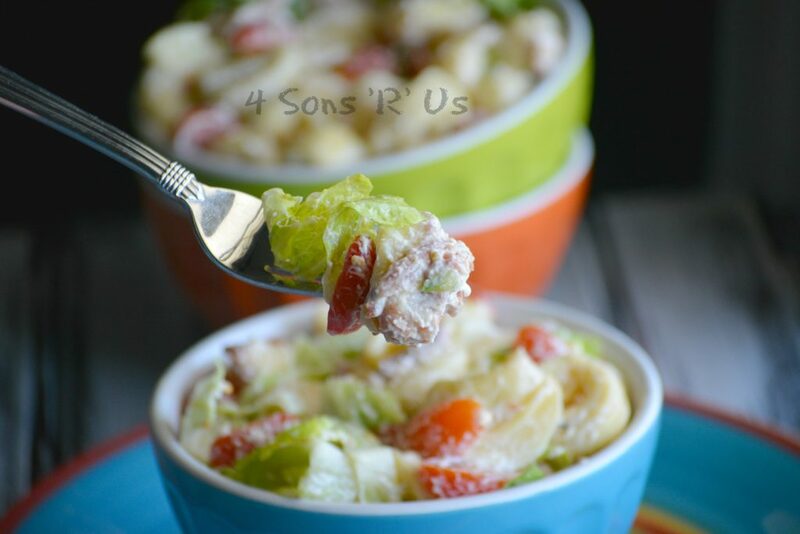 A hearty, yet refreshing pasta salad that combines some of our favorite flavors into a light Summer meal or a popular new side dish depending on your tastes. Prepare the tortellini according to the package directions until al dente. Drain the cooked pasta and the run it under cold water to stop it cooking, until cool to the touch. Transfer the cooled tortellini to a large bowl. Stir in the mayonnaise, sour cream, bacon, tomato, lettuce, garlic powder, and red wine vinegar just until everything's evenly combined. 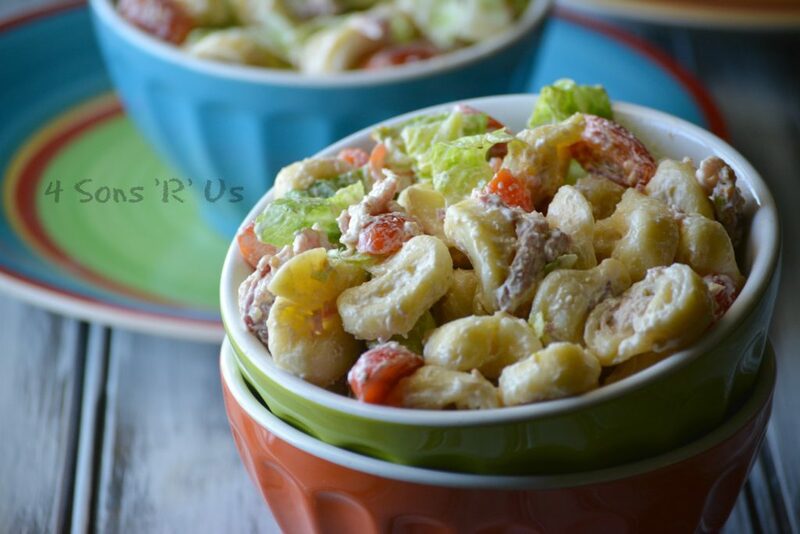 Salt and pepper the pasta salad, to taste. Cover the bowl and place it in the refrigerator to chill, about an hour or so. Serve and enjoy, whether as a meal on it's own or as a side to a great grilled entree. Alright, I’m in love with this! It just looks so cool and refreshing and a nice change up!